IILLvibe is an acclaimed hip hop artist from Toronto, Canada, who also runs a lyric video company, LyricVids.com. He came on our radar after speaking at Future Music Forum in Barcelona, where he hosted a session called “The Importance of Musicians/Artists Thinking Like Content Creators”. 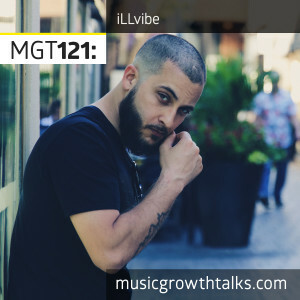 As someone who creates a lot of high-quality content for himself and others, Illy had much to say on this Music Growth Talks episode. He gave examples of when lyric videos come particularly handy, explained why filming a low budget music video can “brand you down”, and talked about reaching new fans through video on social media. He shared tips on using targeted ads and crafting your brand’s story, as well. Listen to the podcast in full to also learn why being an underdog can boost your growth, and what kind of call to acton to give to you superfans.